« Call Your Representative: No Surrender! John Cornyn Isn’t Merely a Coward – He’s a Shameless Fraud Too! This entry was posted on Tuesday, October 1st, 2013 at 07:00 and is filed under AssClowns, Featured, Federal Budget, Idiotic Politicians, News, Obamacare, Political Ads, Politics, Texas Politics. I explained to fellow Texans in a note last Friday why they shouldn’t support John Cornyn. Today comes further evidence. In an effort to further mislead Texans, and in an attempt to pretend his cowardice hadn’t been, this deceptive politician, this un-Texan, has posted a phony poll on his website asking a question based on a false premise. The question itself is a lie. He asks: “Do you agree with Senator Cornyn’s vote to De-fund Obamacare?” The truth is that he didn’t vote to de-fund Obamacare. Instead, he voted to permit Harry Reid and the Democrats to prevail. His poll is garbage. This deception brands this man as a despicable liar. To explain for the readers not up to speed on the trick, John Cornyn joined with Democrats to close off debate on the House continuing resolution, permitting Harry Reid to amend it. After it had been amended, Cornyn then voted against it, along with twenty-four other sell-out Republicans. His phony poll on this webpage(see screen-capture of site below) asks if you agree with his vote to defund Obamacare. HE DIDN’T VOTE TO DEFUND OBAMACARE! He voted to permit Harry Reid and the Democrats to strip the Defunding language out of the bill, so that he could vote against that amendment and pretend to have voted against Obamacare. The cloture vote WAS the vote. Texans aren’t stupid, whatever Cornyn may think of us, and I suspect that as the truth spreads, Senator Cornyn will be heading home for good next fall. This Poll is a complete scam and fraud. A number of Senators implied or directly accused Ted Cruz of trying to use the de-funding push to raise funds. Meanwhile, Cornyn’s phony poll is nothing less than an attempt to solicit email addresses and names so he can later solicit funds. More, since the poll is based on a lie, he’s shamelessly misleading voters both as to his actual position and to the effect of his votes. Classic “for it before against it” nonsense! Naturally, there’s no way to answer it without seeming to support him or Obama-care. 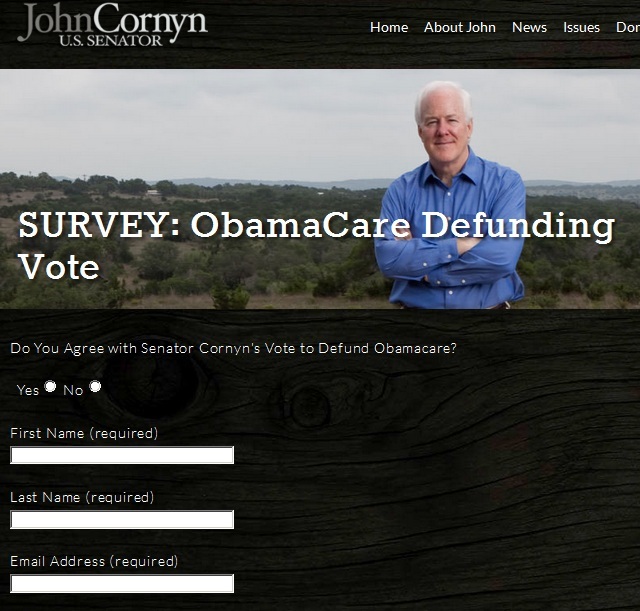 3 Responses to John Cornyn Isn’t Merely a Coward – He’s a Shameless Fraud Too! Great article Mark America. Sarah has reloaded and in full Rino season begins. A awesome thing to behold, one after another rino being replaced with constitutional conservatives!!!!!!! I’m wondering if he thinks this is a win for him either way one answers the ‘poll’ question. If people vote ‘yes’, he’ll think he’s won by duping them. If they vote ‘no’, he’ll be able to point the fact that his constituents really do favor 0care and that is perhaps what he wants more than anything. Erick needs your help to Bring America Back. Visits http://www.ErickWyatt.com and join #WyattsWarriors today. How Corrupt Is Washington DC?